Bringing back our 12 Days of ChristMOOas but adding incredible giveaways each day. Every day we have a special in-store offer plus giving away a BIG prize. Prizes include: Yeti Cooler, $500 Landscaping Services, Birthday Bash at The Little Gym, Color Bar Redemption Card to Kendra Scott in Friendly Center, Roomba, $100 Gift Certificate to A Way To Go Travel, Tights & $100 Shop Card to Athleta, FitBit, PMI Experience Pack (Swarm Club Seats, Grasshopper Tickets, Starbucks Gift Card), Photo Session on The Farm and Wake Forest University Basketball game tickets. On Day 12 we will give away smaller prizes all day long. Here’s how it works: Every $10 spent in The Market earns your 1 raffle ticket entry. Winners will be picked at the end of each day. 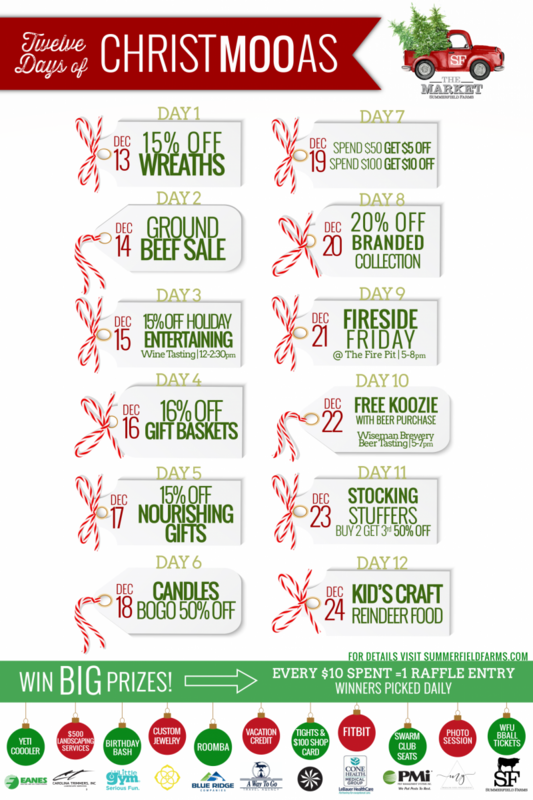 Day 1 [DEC 13]: Wreath 15% off plus a free decorative bow with any wreath purchase. Day 3 [DEC 15]: Wine, Cheese, Crackers and Spreads 15% off plus free samples! Rickety Bridge Wine Tasting 12:00-2:30pm. 4pk Wines Around The World basket is $10 off. Day 10 [DEC 22]: Wiseman Brewery Beer Tasting 5-7pm plus 15% off 4 or 6pk beer. Any beer purchase = free SF koozie! Day 12 [DEC 24]: Night Before Christmas basket 15% off plus kiddos can make reindeer food at The Market.